Why is it that, every time I mention I’ll start posting less frequently (last week I announced I’ll be posting every 3 days instead of every 2 until the end of August), stuff happens that makes me post almost daily instead? 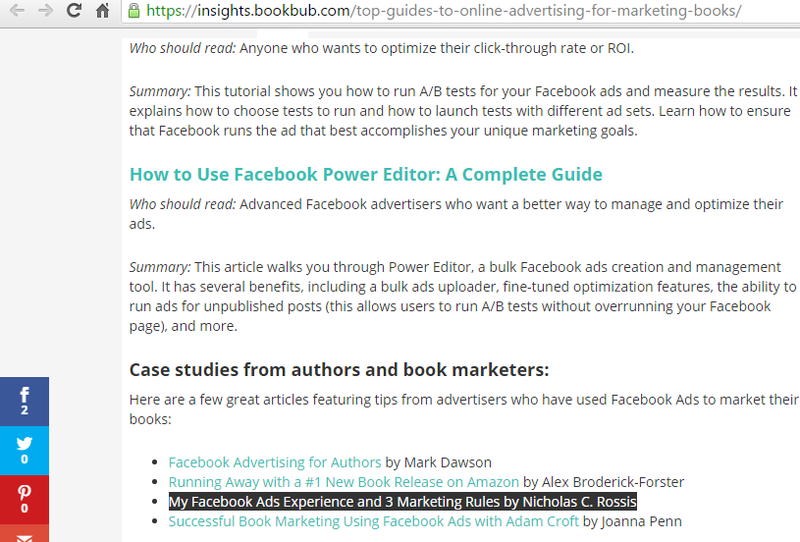 In this case, though, it’s for the best – and weirdest – reason possible: a mention of my post, My Facebook Ads Experience and 3 Marketing Rules in Bookbub’s own blog, Bookbub Insights, right under industry heavyweight, Mark Dawson. In this post, we compiled the most comprehensive guides we could find on three online advertising platforms that are popular with authors and book marketers: Facebook, Google AdWords, and the new BookBub Ads platform. We hope these guides help you understand their different use cases and create successful campaigns. As for me, all I can say is that Diana has obviously put in a lot of hours preparing this post, so be sure to check it out! Why are writers so adverse to tooting their own horns? Remember, art doesn’t apologize! Congratulations! You’ve got some great advice to share, so enjoy the moment! Right on. Cool beans, I will check it out. Thanks for this. Keep being creative, it’s what keeps us all alive. Wow! Congrats and thanks for the resources! Will reblog on Jean’s Writing. Well, up until this minute, it was. Thanks so much, Nick and congratulations. I’m off to check on the posts I’ve missed! Super ! Just goes to show Facebook is currently one of the most effective ways to market and sell almost anything.